magazine has arrived and is available for download now. 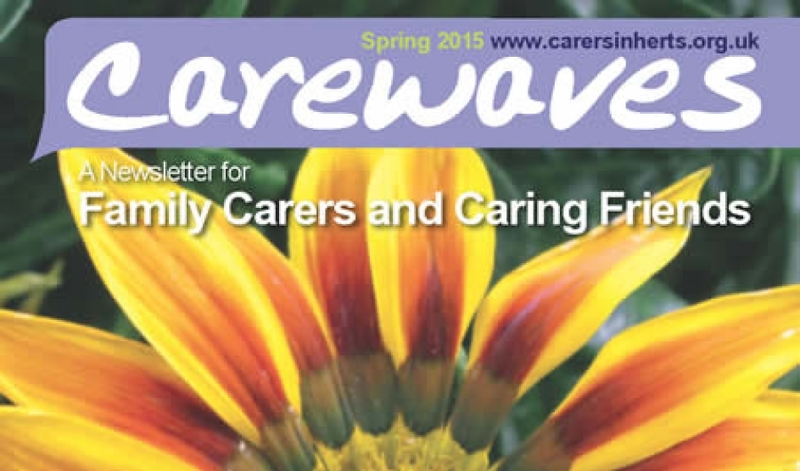 The latest issue of Carewaves (Issue 2 of 2018) is available now and is full of articles about what we and other organisations have been doing to support unpaid carers. You can read about our Annual Event for Carers that took place in September 2018 and about the work that Carers UK and Hertfordshire County Council told us they are doing for carers locally and nationally. As always, there are details about our free, upcoming courses and workshops, forums and our plans to mark Carers Rights Day on Friday 30th November 2018. The Carer’s Assessment - what it is, what it involves and how to request one. Changes to our Young Carers’ Council and plans for the 2019 Young Carers’ Conference. Carewaves is posted or emailed to carers that have requested a copy and are on our mailing list. Contact us to register for your free copy. 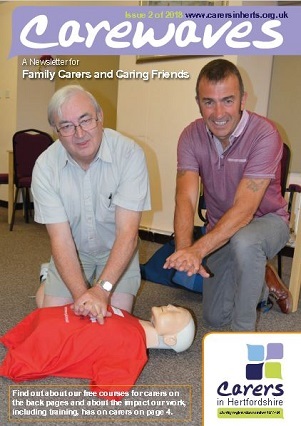 Alternatively, it can be obtained via GP surgeries and libraries throughout the county. You can also download previous issues at the bottom of this page. Details of our courses and workshops can be found on the back page. To view our open events click here. Alternatively you can email or call 01992 58 69 69. We are changing the way we are communicating with carers. In addition to the website and biannual Carewaves magazine, we would like to keep you up to date via e-bulletins. You may be asked for an email address when we contact you. We are also investigating sending text alerts to remind you if you have booked onto a course or workshop, rather like some dentists and doctor surgeries do. If you would like to be kept up to date in this way please let us know. pdf Download your copy of Carewaves Spring/Summer 2018 (8.78 MB) here.